Ghanian ''witch-doctor'' dances his magic in the match against Uruguay. Unfortunately for the Black Stars and Asamoah Gyan, it was not enough. Uruguayan supporters in bouyant mood before their match against Holland in Cape Town. The ''Calabash'' Soccer City Stadium on the outskirts of Soweto, Johannesburg. Inside Ellis Park in the build-up to the match between Spain and Paraguay. Well prepared: Supporter makes her way to the Cape Town Fan Zone with not one, but two vuvuzelas. All dressed up with somewhere to go: Bafana Bafana aficionado lends her support. 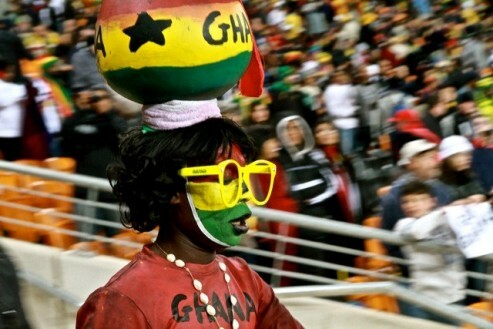 Black Stars supporter watches intently during match against Uruguay at the ''Calabash''. Showing her true colour: A Spanish female supporter during the match against Paraguay at Ellis Park. Kito Johnson, a Trinidadian, is a freelance journalist based in the UK. He specialises in Caribbean affairs and has written extensively for the Trinidad Guardian in his native land, as well as the Voice Newspapers, BBC Caribbean and The New Black Magazine here in the UK.